Amazon Books, the company’s first brick-and-mortar store, will open tomorrow Tuesday, Nov. 3, 2015 in Seattle’s University District. Bookstore owners often think of Amazon.com as the enemy. Now it’s becoming one of them. At 9:30 Tuesday morning, the online retail giant will open its first-ever brick-and-mortar retail store in its 20-year life, in University Village. The store, called Amazon Books, looks a lot like bookstores that populate malls across the country. Its wood shelves are stocked with 5,000 to 6,000 titles, best-sellers as well as Amazon.com customer favorites. Last month, the online book newsletter Shelf Awareness broke a story speculating that Amazon was developing the store in the former Blue C Sushi location. There is some irony in Amazon’s opening a physical store. For years, it could undercut physical retailers on price because it didn’t have brick-and-mortar locations. But those stores offered something Amazon couldn’t: the instant gratification of owning an item the second it was purchased, as well as the personal touch of a knowledgeable sales clerk. Mika Yamamoto, director of marketing for Amazon Books, works inside of Amazon Books in Seattle Monday, Nov. 2, 2015. Amazon Books, the company’s first brick-and-mortar store, will open tomorrow Tuesday, Nov. 3, 2015 in Seattle’s University District. Alyssa Boggs, executive assistant at Amazon, works inside of Amazon Books, the company’s first brick-and-mortar store, Monday, Nov. 2, 2015. Amazon Books will open tomorrow Tuesday, Nov. 3, 2015 in Seattle’s University District. Katherine Sotol, books lead at Amazon Books, works at a technology display at Amazon Books Tuesday, Nov. 3, 2015 in Seattle’s University District. The retail space will offer store offers 5,000-6,000 books as well as technology devices like e-book readers and the Amazon Echo. Amazon Books offers Kindles, e-book readers, throughout the store to provide more information on books offered in the store’s isles. Amazon Books, the company’s first brick-and-mortar store, will open tomorrow Tuesday, Nov. 3, 2015 in Seattle’s University District. Amazon’s Annie Zamojski works inside the company’s first brick-and-mortar bookstore, in Seattle Monday, Nov. 2, 2015. The store will open tomorrow Tuesday, Nov. 3, 2015 in Seattle’s University District. Jennifer Cast, vice president of Amazon Books, gives a tour of Amazon Books’ new 5,500-square-foot retail space in Seattle’s University District Monday, Nov. 2, 2015. 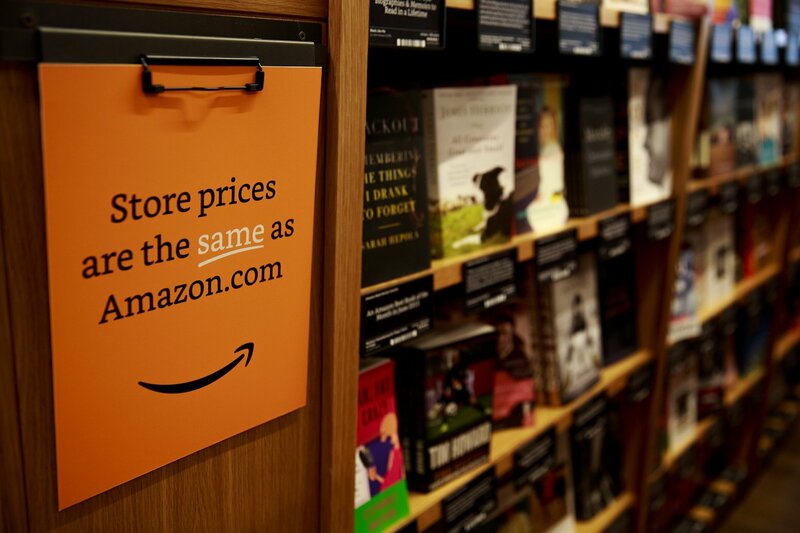 Amazon’s first brick-and-mortar store offers 5,000-6,000 books and will open at 9:30 a.m. Tuesday, Nov. 3, 2015. Children’s books are displayed at Amazon Books, the company’s first brick-and-mortar store, in Seattle Monday, Nov. 2, 2015. Amazon Books, the company’s first brick-and-mortar store, will open tomorrow Tuesday, Nov. 3, 2015 in Seattle’s University District. The retail space offers 5,000-6,000 books as well as technology devices like e-book readers. Amazon Books, the company’s first brick-and-mortar store, will open tomorrow Tuesday, Nov. 3, 2015 in Seattle’s University District. The store offers an answer desk in the store.